The SD card (short for Secure Digital memory cards), is commonly used by compact storage devices, including digital cameras, mobile phones, music players, camcorders, etc. so as to expand the storage capacity of your device. With it, you are free from troubles of Not Enough Space Available alerts while using your Android phone. But you should know that an SD card is not of unlimited space and one day you'll also find that it is packed with all different files. In this case, you may need to free up some space on your SD card to save other new files. No doubt, you can delete such files within your Android phone one by one if you have enough spare time. However, sometimes the case is that you need to fully erase SD card on Android phone, for example, when you plan to sell out your old SD card or simply give it to your little brother. Under such circumstances, simple deletion within the device is far from being enough to say a permanent goodbye to these files saved on a SD card. But this Android SD Card Eraser (Windows/Mac) says YES! - With this software, you are free to erase an external SD card without any restrictions, with zero possibility of being recovered. - All files saved on the SD card will be automatically detected and displayed on the main interface. - Various files can be fully compatible like music, photos, videos, apps and many more saved on SD card as well as other files saved in the internal memory or SIM card like contacts and messages. - As long as your device is running Android operating system, this software can always be the lifetime data eraser for your device. To list just a few. With this almighty data eraser software, any unwanted yet private files can be wiped out for good. So there is no need to worry about potential privacy leak at all. Now, below are the free trial versions of this software! You can actually download the right version and give it a try by yourself! Step 1. After downloading and installing the software on the computer, open it. Then get your Android phone connected to the computer via the USB cord and install the MobileGo connector on your device. 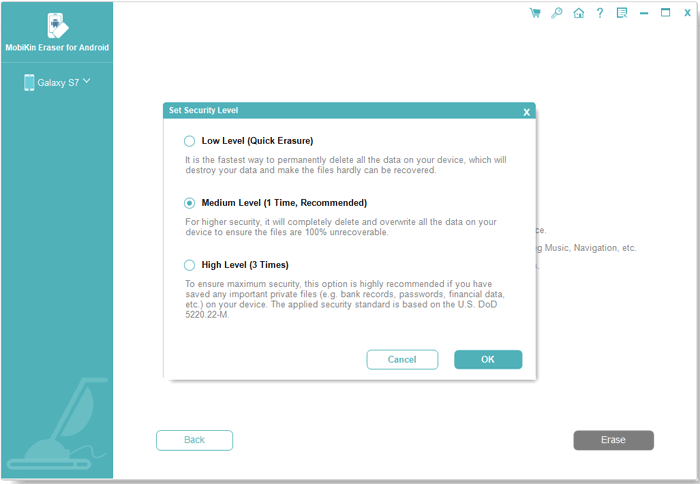 Then this software will detect your device and scan for all files saved on SD card. Step 2. Now, you will see an interface where different erasing modes are displayed. 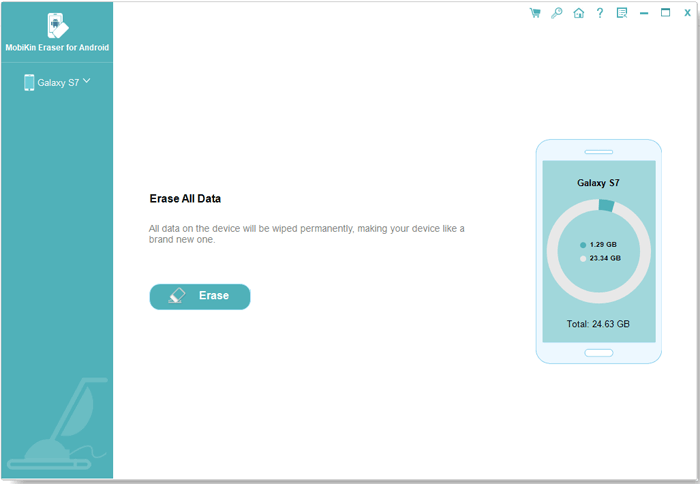 You can now choose the mode of Erase All Data to continue the process. Step 3. Finally, on the promo dialogue, type "delete" and then hit the Erase option to confirm your action and then wait patiently for the process to get completed within a little while.